We’d love your help. Let us know what’s wrong with this preview of Genesis Girl by Jennifer Bardsley. Blanca is pur Eighteen-year-old Blanca has lived a sheltered life. Her entire childhood has been spent at Tabula Rasa School where she’s been protected from the Internet. To ask other readers questions about Genesis Girl, please sign up. Really enjoyable and unique story. I have been thinking about it for the past day and how to best describe it but it really is super unique. This idea of a set of people in society with not virtual footprint is SO INTERESTING! I loved the take on this dystopian/ futuristic world. I really enjoyed the romance that grew through out the novel, also the MYSTERY AND THRILLING EVENTS IN THIS BOOK ARE SO GOOD! It started perfectly perfect. I was so amazed by the beginning and the synopsis, but somehow, along the way, this book lost its magic. I liked so much Blanca at the beginning. She looked like a strong girl, ready to face everything. This lasted for about 1/3rd of the book. Then she sounded totally like another person. She was influenced so easily by everyone and kept changing her opinions, thoughts and decisions very often. It made her look so immature. She ended up looki So, yeah.. this happened. I liked so much Blanca at the beginning. She looked like a strong girl, ready to face everything. This lasted for about 1/3rd of the book. Then she sounded totally like another person. She was influenced so easily by everyone and kept changing her opinions, thoughts and decisions very often. It made her look so immature. She ended up looking like a spoiled teenager. I liked Seth and his father. They made this story finish-able. The idea about this book was very unique. Kudos to the author. I'm not sure I want to read another book in this series, though. Blanca is such a boring and often annoying character. The romance didn't convince me either. Too forced and unnatural. Some days, I feel kind of horrified by the influence technology holds over my life. I’m joined at the hip with my phone. My fingers are glued to my tablet. My iPod is on full blast. So I was immediately intrigued by the premise for GENESIS GIRL, which is set in a future where the aftermath of a brain cancer epidemic brought on by cell phones scared parents though to entrust their children to a leader who would keep them safe and technology-free. These children would grow up to be Vestals, and wo Some days, I feel kind of horrified by the influence technology holds over my life. I’m joined at the hip with my phone. My fingers are glued to my tablet. My iPod is on full blast. So I was immediately intrigued by the premise for GENESIS GIRL, which is set in a future where the aftermath of a brain cancer epidemic brought on by cell phones scared parents though to entrust their children to a leader who would keep them safe and technology-free. These children would grow up to be Vestals, and would have no Internet footprint. This makes them extremely valuable. Companies want them to advertise their products, knowing there is no chance that a Vestal could have a sordid backstory traceable online. The main character in GENESIS GIRL is Blanca, a Vestal who is auctioned off to the highest bidder. Except instead of being on billboards and magazine covers selling soap, Blanca’s buyer, Cal, has a different idea. He wants her to act as his daughter, and help him gain a relationship with his estranged son, Seth, who is the total opposite of Blanca—technology-addicted and the operator of an online blog intent on exposing Vestals. But even though she’s fundamentally opposed to everything he stands for, Blanca finds herself falling for Seth, although she’d never admit it. When she starts to learn more about the Vestal leader and the secrets of her past are brought to the surface, Blanca must tap into the courage to do what she’s never been able to—think for herself, and make her own decisions. Fast-paced and action-packed, this was a book I had a hard time putting down. I desperately wanted Blanca to claim the life Cal wants her to have, complete with freedom and the ability to do the things she wants to do. As a main character, she’s very intriguing—because of how she was raised, she has no idea what she wants in life or how to achieve it. Her journey to find herself is, for me, the most fascinating part of the story. I love how completely original the concept of the story is. Jennifer Bardsley has envisioned a future wherein technology isn’t just at one’s fingertips, but in them, in the form of finger-chips. Blanca is disgusted with how dependent people are on technology. Having never been online, she’s at the opposite end of the spectrum. It's a commentary on our society today-- how sometimes, it's almost impossible to disconnect from our devices. A thought-provoking, imaginative, and totally unique story—I’m looking forward to the sequel! Anyways, some genius thought it would be a good idea to start a school where children would be protected from technology. When they grow up, they would have no digital footprint. Their blank history made them valuable, and companies would bid for 'vestals' during the harvest. The vestals would then be used in their advertisements, and people all over the world bought whatever they were selling because they were just mesmerized by these higher beings. Blanca isn't just any vestal. She's the most desired girl, and her bidder pays a fortune for her. When she arrives at his mansion, she learns so much more than she ever did back at her school. She tackles on a lot of new feelings and thoughts. Add a boy to the mix, to make her mind even more confused. Seth is a 'virus.' He's basically a blogger/journalist, always searching for the truth. He's got tattoos, rides motorcycles, and looks super hot. Seth is also the son of the man who purchased Blanca. Does he make the cut to be my YA boyfriend? Yup! Genesis Girl satisfied my YA craving. I wasn't sure if this was going to be for me, but I ended up LOVING it. There's plenty of mystery, young romance, and even some action. I couldn't stop reading. I can't wait for book 2! I received a free ebook copy from Month9Books in exchange for an honest review. Thank you to Month9Books and Jennifer Bardsley! When I first started reading Genesis Girl I wasn't sure about it. The beginning was a little odd and confusing to me. Once I got adjusted to the world then it got so much better and the rest of the book just flew by. At the start of the book I was not sure where the story was going to go, but I was pleasantly surprised at where it did go. I was not expecting Genesis Girl to raise some important questions about how addicted we are to technology, but it did. I say this as someone who is too attached to my iPhone, iPad, MacBook, and all other things technology related. I just love technology, but how much is too much? At what point does the addiction take over our lives and what should/could be done about it? That's where Genesis Girl comes in and why it's such a fascinating read. Blanca is a blank slate with no virtual footprint and that makes her very valuable in a world overcome with tech addicted people. I was not sold on Blanca's character at first, but as the book went on she had some great character development. She went from a very naive and dull character to an intelligent and entertaining character. I loved the parts with her and Seth together. I can't wait for the next book to see what happens next! Overall Genesis Girl is a captivating story. It's a well written and very intriguing read for this day and age where we are so focused on our technology. I recommend Genesis Girl for fans of thought provoking YA sci-fi novels. "...the internet is addicting. It tears users apart from the people they love." What an interesting concept! Can you imagine having never had access to the internet? How would you go not being able to have the use of a mobile phone? I can remember when the technology that we have, and take for granted today, was first introduced to me. I was blown away by the internet and what became available to me at the touch of a button. The same goes for mobile phones. I never for a minute thought that I w "...the internet is addicting. It tears users apart from the people they love." What an interesting concept! Can you imagine having never had access to the internet? How would you go not being able to have the use of a mobile phone? I can remember when the technology that we have, and take for granted today, was first introduced to me. I was blown away by the internet and what became available to me at the touch of a button. The same goes for mobile phones. I never for a minute thought that I would ever become reliant on the technology that we have today, but I'd be absolutely lost without it! They had castrated my virtual identity for the promise of a better life. Blanca and her fellow students at Tabula Rasa have lived their whole lives sheltered from cyberspace. That makes them very valuable. Upon graduation they are sold off to the highest bidder who utilise them for promotion and sales of their products. But the man who purchases Blanca has other ideas for her. I am loyal. I am discreet. I follow the rules. I think the thing that I liked most about Genesis Girl was the growth of Blanca. For most of the book she really struggles to think for herself and make decisions. That's how she's been raised. But as things develop and situations are brought to light, Blanca finally begins to think for herself. She learns that she's more than what she's been raised to believe, and she also doesn't just blindly take as oath everything she's told. I also really liked Cal, who was the one to purchase Blanca, and his son Seth, who runs a tabloid blog. Although there were times that I wished that they'd communicate better with each other, I really liked where things ended up for them. Despite Seth's tough exterior, he really had a soft, caring heart. I did think that occasionally things moved a little too quickly and could have been a bit better fleshed out. However, I do really look forward to gaining a greater connection with the characters in the next book though. A quick and intriguing read, Genesis Girl certainly had me thinking about different aspects of the media and the ways they go about gaining a story. If you're looking for an original storyline, then Genesis Girl is definitely that. Internet access is now a part of everyone’s life and it’s hard to determine what would happen if we were forced to give up our precious technology. For this reason, the concept of Genesis Girl fascinated me. I loved the way the author explores both the good and bad of technology and presents two extremes – the Vestals (who have no online presence) and the Viruses (whose lives revolve around technology). I’m really looking forward to reading the rest of the series and finding out if there’s a mid Internet access is now a part of everyone’s life and it’s hard to determine what would happen if we were forced to give up our precious technology. For this reason, the concept of Genesis Girl fascinated me. I loved the way the author explores both the good and bad of technology and presents two extremes – the Vestals (who have no online presence) and the Viruses (whose lives revolve around technology). I’m really looking forward to reading the rest of the series and finding out if there’s a middle ground for Blanca and Seth, as well as the entire imagined society. Aside from the intriguing premise, this book was just plain fun to read. The pacing was extraordinary. Blanca’s voice was fascinating. She started out as someone who’d been brainwashed. But, out in the non-Vestal world, she needed to learn to rely on her own instincts in order to survive. This is a very short book, probably more of a long short story. I was entertained. The writing is sharp and easy to read. I was in the mood for a quick YA story and that's just what I got. The world portrayed makes me think of the kids being raised by strict polygamist families in Southern Utah, Canada and maybe still in Mexico. Keep the women and kids away from the horrors and pollution of real life, Television and the internet so that they can serve the men in various ways. Three stars means I This is a very short book, probably more of a long short story. I was entertained. The writing is sharp and easy to read. I was in the mood for a quick YA story and that's just what I got. Three stars means I liked it. A credible job of creating a futuristic world. Technology is addictive. I have a hard time drawing myself away from my phone or my iPad. Genesis Girl contains a world where technology has caused ruin; cell phones caused a sweep of brain cancer which killed a great number of people and made others wary of any form of technology. It is a rather stark, but realistic picture of the future we could someday face. This movement is called the Vestals. They are free from all forms of technology, raised to lead very sheltered lives until they are chosen by bidders to become the face for various campaigns and sell the products they are told, leading lives they really have no control over. Any novel that starts with someone getting kicked in the balls is going to be awesome. This book truly does begin this way. It is action packed and fast paced throughout. I never felt like there was a time when I was bored or not dying to see what was going to happen next. The main character Blanca sells for the highest amount during the ceremony the Vestals undergo when they turn old enough. In a moment, her life is changed forever. She goes from living among her own kind to living in a world she was taught to manipulate in subtle ways and do whatever she can to please her bidder. She doesn't believe she has any free will or choice of her own. Blanca craves to be told what to do, how to act, and who to be. When Cal, her bidder, tells her to make her own choices-- such as becoming a part of his family as a daughter-- Blanca struggles. She has a hard time processing not being controlled by other people because it's what she has been taught her whole life. Blanca surprised me by how strong she is. In the beginning, she wants to lose herself in being told what to do and not imagine a world where she is able to make choices. As chance and opportunities are presented to her, she begins to see the world in a whole new way. Although Blanca has a hard time, she learns to embrace the new world she is living in. I was immediately pulled into Blanca's world, where technology overruns the lives of most (known as Viruses), except a select few raised apart from society (known as Vestals). But of course, corporations find a way to profit from Vestals, auctioning them off to the highest bidding corporation to be used as pure advertisements in a world filled with imperfections. The majority of the novel takes place in the McNeal manor, and this is carried out perfect. Never once did it seem limiting. The charact I was immediately pulled into Blanca's world, where technology overruns the lives of most (known as Viruses), except a select few raised apart from society (known as Vestals). But of course, corporations find a way to profit from Vestals, auctioning them off to the highest bidding corporation to be used as pure advertisements in a world filled with imperfections. The characters are developed wonderfully, even in Blanca's "breakdown" period, she never seems whiny or fussy, always abiding to her Vestal rules. Sometimes a synopsis hooks you in, but doesn't deliver. That is not the case this book. This story is completely unique and unexpected, taking a reality that is easy to comprehend and twisting to pure fantasy. Have you ever gone a period of time with no technology? No phones. No internet. No social media. If yes, did you have an inch to log on? This book explores our obsession to the point of addiction with technology, taking it one step further. Those addicted to the internet are called Viruses. By their standards, I, as a blogger, am a Virus. Building the obsession for information. On the flip side are Vestals, with no tech footprint. They are isolated from society for a period of time, until the Harvest, when companies, or individuals bid on them to represent their brand, or in the latter case, to become a Geisha. Blanca is raised at Tabula Rasa, their training school. Right before the Harvest, her picture is captured by a Virus, Seth, who unknowingly changes the course of both of their lives. Until about two minutes ago, I was a Vestal postulant. A blank slate. An Internet virgin. From there she receives the highest bid, becoming a Geisha to Calum McNeal. But things are not as seedy as they might seem. Cal has other interests that require Blanca's assistance. From the moment Blanca enters Cal's home, her vulnerability is exposed. She literally cannot think for herself. She expects, based on her training, for Cal to tell her what to do. At first this is fine, but with time, her lack of direction becomes seriously worrisome. Thus begins a downward spiral. I should have done better. I should have lived up to my platinum cuff. I should have embodied what it means to be top pick. I liked Blanca's characters, and although she is weak, it is merely who she is trained to be. As she struggles to adjust to her new world, it exposes how ill prepared she is for taking control of her life. However, several people reenter her life that make her begin to question things. There's something twisted about a guy who would leave me lying here in bed to go look at stuff online. I've probably given more away than I should, but I can tell you that this book will stretch your brain. It's wildly creative and entertaining. I could easily see the story on the big screen. It's no surprise that I trusted the Viruses more than the Vestals, but didn't always like their tactics. Seth being the exception. He's very protective of Blanca, and pushes her to think for herself. If you are looking for something different, that will get you thinking about the role technology has in your life, then I'd highly recommend this. I recieved a copy of this book from the publisher in exchange for an honest review. This book was such an odd read. The concept is really cool and interesting but I had such a hard time relating to the main character. I really loved Blanca's character development. I thought was nearly spot on and I'm curious to see what development she has in the next book. However, she was so... dramatic. She came across as brain washed and plain and boring. I felt bad for hating her because she was brain washed I recieved a copy of this book from the publisher in exchange for an honest review. I really loved Blanca's character development. I thought was nearly spot on and I'm curious to see what development she has in the next book. However, she was so... dramatic. She came across as brain washed and plain and boring. I felt bad for hating her because she was brain washed but I couldn't help disliking her. I couldn't relate to her at all and because of that, I couldn't become invested in the story. Tabula Rasa School is very cult like and I don't remember it being addressed how awful it is. I don't remember the whole auctioning-people-off-like-property thing being addressed either. Hopefully all that will be addressed in the second book. The writing style was okay. I feel like it could have been cleaner and edited better. Overall, Genesis Girl has a really cool concept but troublesome issues weren't addressed and I wasn't a fan of the main character. I'm very curious to see what the next book brings to the table. So unique! Haven't read anything like this—students (Vestals) growing up in a place protected by the Internet. It's nearly midnight, so FRTC, but I am deeply impressed with the futuristic world Jenny Bardsley created! Love Blanca, Seth, Cal, and Lydia. Love Fatima and Beau. Yes, technology definitely has its evils, but there's a lot of good. This novel will open your eyes and see it through different lenses. If you're looking for something different: sci-fi, futuristic, thriller romance, definit So unique! Haven't read anything like this—students (Vestals) growing up in a place protected by the Internet. If you're looking for something different: sci-fi, futuristic, thriller romance, definitely check out GENESIS GIRL! Blanca knows that the way of the Vestals is the best way. The clean way. The correct way. She's untouched by the crazed culture of implanted internet addiction that rages in the world around her walled sanctum. She's grateful to be a Vestal--one of the select few people, both male and female, who are raised to have no digital footprint. The beauty and purity of the Vestals, and their mystique, means that though they shun the media, the media will always keep trying to penetrate their secrets. Bla Blanca knows that the way of the Vestals is the best way. The clean way. The correct way. She's untouched by the crazed culture of implanted internet addiction that rages in the world around her walled sanctum. She's grateful to be a Vestal--one of the select few people, both male and female, who are raised to have no digital footprint. The beauty and purity of the Vestals, and their mystique, means that though they shun the media, the media will always keep trying to penetrate their secrets. Blanca's been trained, like the others, to obey without question. So she doesn't question a lot of things...including why Vestals raised to never be photographed, to never take part in the voracious media madness, would suddenly, when they reach the right age, be auctioned off to the highest bidder and become the media faces of huge global companies. But when a media hound breaks into the Vestal compound and manages to get a photograph of Blanca, he sets in motion a chain of events that forces Blanca to face the truth right in front of her eyes...and to discover truths even more dangerous that have been carefully hidden. Exciting, action-packed, full of suspense. I found that this book didn't cleave to a predictable, routine format, so I was constantly being surprised by what developed. I even had suspicions of certain characters, who turned out to be different than I supposed. The author uses the filter of Blanca's naive and inexperienced point of view to make certain plot twists even more effective. Then Blanca begins to learn and change, so the reader can discover how things really are, right along with her. What a thrill ride! I love this kind of speculative fiction--it makes us question the way we behave in the Now, in light of how these things might play out in this generation or the next. You read it and say to yourself: "Oh, things could never get that bad, we would never go that far.." and then you wonder "....or would we?" So I think if you loved books like Kate Jarvik Birch's PERFECTED (like me), then you'll also love GENESIS GIRL (like me). I finished it fast, and I'm still thinking about it. I had two questions at the end: When is Book 2 coming out, and when will there be a movie?!! MC Blanca is a cyber virgin known as a Vestal in the future world setting of Genesis Girl. Groomed in isolation with other Vestals from birth, she is taught to be obedient, unthinking and compliant. In this future world, society is tech-consumed with hardware now implanted into fingertips. Vestals, because of their cyber-purity, are the new celebrities and purchased at exorbitant prices by corporations to advertise. Well, that's the goal. In Blanca's case, a paparazzi-tech manages to get a photo MC Blanca is a cyber virgin known as a Vestal in the future world setting of Genesis Girl. Groomed in isolation with other Vestals from birth, she is taught to be obedient, unthinking and compliant. In this future world, society is tech-consumed with hardware now implanted into fingertips. Vestals, because of their cyber-purity, are the new celebrities and purchased at exorbitant prices by corporations to advertise. Well, that's the goal. In Blanca's case, a paparazzi-tech manages to get a photo of her before she is "harvested" - i.e. purchased by a corporation. Forced to take a decidedly different path ahead, Blanca is offered a freedom she never envisioned. And with this freedom comes a chance at love and the possibility of exposing the Vestal System for what it truly might be. Genesis Girl grabbed my attention from the first time I'd heard about its unique premise: The main character holds the highest value in a technology-obsessed society because of her lack of an online footprint. I'm happy to say that the book did not disappoint. Bianca is a Vestal, a person who is raised to bear no digital footprint and keeps a clear distance from the media—until she is unexpectedly forced into the media spotlight. 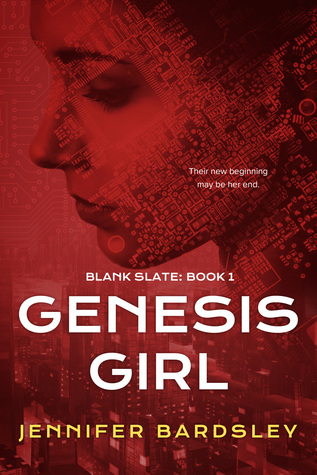 Without giving too much away, this book was full of suspense and k Genesis Girl grabbed my attention from the first time I'd heard about its unique premise: The main character holds the highest value in a technology-obsessed society because of her lack of an online footprint. I'm happy to say that the book did not disappoint. Bianca is a Vestal, a person who is raised to bear no digital footprint and keeps a clear distance from the media—until she is unexpectedly forced into the media spotlight. Without giving too much away, this book was full of suspense and kept me guessing about who the real villains were. When Bianca begins to see the truth of her society, the reader follows her in this discovery. I’m not typically a reader of speculative fiction, but I am so glad I bought this book! I don't review books, but I do blog about them. Okay where do I start with this one. First of all, I was really confused. It felt like the beginning was told out of order almost. There was a "fast paced introduction" that was followed by some random introductions and an info-dump. But even the info-dump didn't tell me anything that cleared up my confusion. I was also really uncomfortable with how this whole process was explained and being treated. I feel like there was potential to go in a completely different direction that was just overlooked. And it also felt like the whole auction thing was just a plot device rather than an actual situation. Blanca was an okay main character but being in her head was confusing because she was over excited about some things and shrugged other things off. She was inconsistent with her attitude towards things and I feel like she just agreed to whatever the author thought would be the best way to move the plot forward. And don't get me started on the instalove. And the tech hate. I just. No. Anyway, I tried and was going to finish just to finish but then there was a shoot out and I thought "nope" and here I am. Hopefully I actually finish my next read. Genesis Girl follows our main girl Blanca and her journey with the "tech" world. It is set in a future where technology and the internet have affected the human race negatively-- causing brain cancer because of cell phones. So it's been upped and people WORSHIP t I made a mistake with this book. I started it as I was in bed ready to sleep thinking I'd just read a chapter. Well, a chapter turned into two hours and being halfway done with Genesis Girl. I finished it the next morning and was amazed. Well, the storyline was promising, but I must say I was not convinced by the execution. The idea of a future world composed of people addicted to social medias is really not so far from reality. And a part of the population decimated by brain cancer due to excessive radiation is a frightening but plausible hypothesis. The main character, Blanca, is part of what is considered an elite in this over-connected world : Vestals. Kids raised without any contact with the Internet, and an online social blank slate. This idea of purity would have been interesting to me if it had developed to serve a higher purpose, but I found it disappointing that it was used only for commercial purpose. The first scene was promising (Blanca defending herself against the Virus), but I think it was incompatible with what I read about her next. I can't imagine someone fighting in the first scene of a book and not being able to think for herself next. But what was mostly disturbing to me was I was not able to connect with Blanca, at all. In general the first person narrative helps me connect with characters, cause I know what they think and most of all what they feel. It allows me to relate to what they're experiencing. But the narrative here was somewhat emotionless, and I was not able to care about her. I thought the love story was hard to believe, and kind of instalove (at least from Seth's point of view), and though their opposition later was kind of interesting, it wasn't enough for me to compensate the flaws and inconsistencies of the book. Lucky me! I received an ARC of this 2016 YA novel. What a creative, imaginative debut! At the beginning of the book, Blanca is about to be auctioned off for her ability to be a virtual blank slate--no web presence, no digital life, no implanted finger chips, nothing. She also has the disability of having been brought up in a cult-like environment which has kept her personality and her ability to think for herself a blank slate too. With shades of Margaret Atwood's Handmaid's Tale, and a bit of B Lucky me! I received an ARC of this 2016 YA novel. What a creative, imaginative debut! At the beginning of the book, Blanca is about to be auctioned off for her ability to be a virtual blank slate--no web presence, no digital life, no implanted finger chips, nothing. She also has the disability of having been brought up in a cult-like environment which has kept her personality and her ability to think for herself a blank slate too. With shades of Margaret Atwood's Handmaid's Tale, and a bit of Beauty Queens by Libba Bray, Bardsley creates a fast-paced, original story. I'm thrilled it will be out in the world in September 2016! Such an amazing read! If YA Sci-Fi is your thing, I highly recommend picking it up! Hundreds more reviews like this one at Mrs. ReaderPants. The synopsis for Genesis Girl doesn’t really do it justice. Genesis Girl is a thought provoking look at our obsession with technology. Also, obviously, on our obsession with sharing every thing that happens in our lives. It does make a good point on how people can take stances to the extreme on things. Tabula Rasa is a school from practically from the Dark Ages. It keeps its students completely sheltered from the internet. In the process, it also ensures that they aren’t allowed to experience di The synopsis for Genesis Girl doesn’t really do it justice. Genesis Girl is a thought provoking look at our obsession with technology. Also, obviously, on our obsession with sharing every thing that happens in our lives. It does make a good point on how people can take stances to the extreme on things. Tabula Rasa is a school from practically from the Dark Ages. It keeps its students completely sheltered from the internet. In the process, it also ensures that they aren’t allowed to experience differing views or opinions. Its creepy at best, and brain-washing at worst. However, it does a very good job selling all it’s downfalls as positives to make people extremely rich. Right from the beginning, it’s obvious something isn’t right with Bianca or the situation. Blanca is the ultimate good student. She tows the company line with almost blind fervor, and watching the McNeals try to help her is extremely frustrating at times. I can’t tell you how many times I wanted to reach into the book and give her a good hard shake. It was also kind of scary to think about. That someone could be that brain-washed. Genesis Girl, book 1 in a planned Blank Slate series, will please a lot of YA readers. The idea of the Vestals is interesting. I can see this being something that could actually happen in our not-too-distant future. Everything is online, so the idea of someone being completely private and only getting allowed glimpses into their life could become an encompassing craze. There’s a bit of familial drama, and external intrigue to ratchet up the tension. Bardsley lays everything out very logically, and it’s no surprise when things get revealed to be what they are, but there was a twist at the end that readers probably won’t expect. I know I didn’t. Genesis Girl fell just short of being a fantastic read. There were a couple of scenes that just didn’t feel well-executed. There’s a development near the end that just seems to happen a bit too suddenly for me to easily buy it. Relatively minor nitpicks, overall, but just enough to keep me from raving about how awesome the book is. Overall, this is a great debut work from Jennifer Bardsley, and I look forward to reading more from her in the future. The blurb was the hook which reeled me in. The premise of a dystopian world, so near our time, in the future where Vestals, technology virgins, exist was so unique and ingenious that I had the thought that I had to read this book period! So did the book satisfy me or disappoint me is the question of the hour. Blanca is one of the Vestals and she is sold to Cal who uses her for personal gains and reasons. She is a technology innocent and how she comes to better understand the world and her own precarious position is the story which unfolds. The beginning literally went boom with Blanca's action scene and the story started off on a note of fast paced action. I have to note that I expected Blanca to be meek and submissive from what I understood from the blurb. But she turned out to be manipulative as per her instructions, strong and steadfast in her beliefs. It wasn't easy for her to change my perspective but when she did, she took a strong stand. The side characters like her fellow Vestals could have been given more scenes in my opinion. The story was so focused on Blanca that all others were ignored. That kind of disappointed me. I like side characters who add so much depth to the tale. Seth and Cal were interesting with their background stories and their interaction with Blanca showcased the world they were in, in detail. It was from their conversations and dialogues that I was able to piece together the intriguing world the author has introduced in this book. The take on the technology addiction has made me take a second look at myself and my dependence on the various gadgets and internet. This is one premise which seems to be very near our real life. I for one look forward to the sequels and I am sure they will also be fast paced and well thought out like this one. I recommend this to sci-fi lovers out there. This is one book which would make you sci-fi genre lovers for sure if you aren't.